Angelo Perera scored 201 and 231 respectively at the P Sara Oval in Colombo while leading the Nondescripts Cricket Club. Sri Lanka batsman Angelo Perera had memorable outings in the middle-order during the recent Unofficial ODI series against the Ireland A. Angelo struck a 127-run knock in the first-class match against the touring party Ireland A and started the 5-match ODI series with a score of 8. In the next four games, he smashed 169 runs without being dismissed. With the same form, he stepped into the Sri Lankan first-class tournament, the Premier League Tournament Tier A. 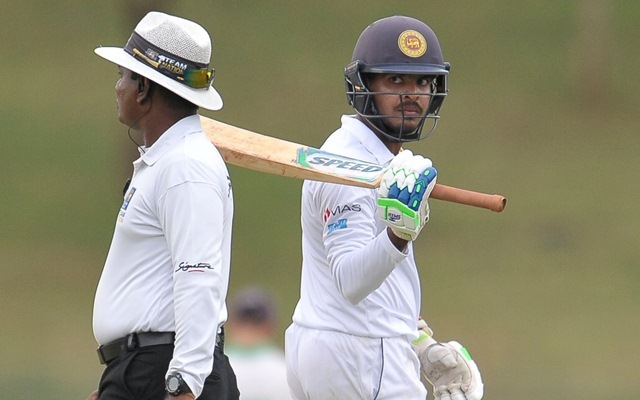 Facing the Sinhalese Sports Club, Angelo Perera rescued his team Nondescripts Cricket Club with a brilliant double century in the first innings. Perera scored 201 off 203 balls with 20 fours and a six. He shared a 102-run stand for the 9th wicket with Sachinta Peiris to take NCC past 400. Perera was the last man to be dismissed after completing his double ton at the score of 444. The SSC side finished with 480 to take a 36-run first innings lead. The NCC skipper Angelo Perera got support from the other batsmen in the second innings where he scored yet another double hundred. He was a bit slower in the second essay taking 225 balls for the milestone. He made 231 from 268 balls with 20 fours and three sixes as Nondescripts finished on 579/6 before the end of the game. 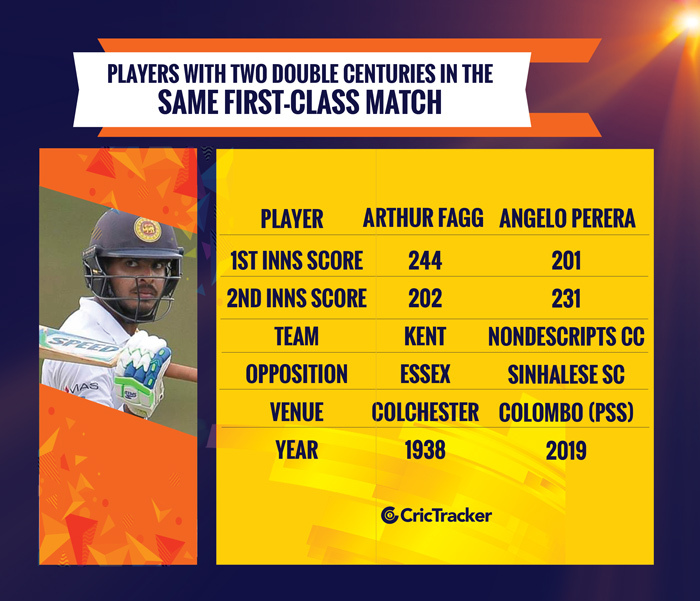 With scores of 201 and 231, Angelo became only the 2nd player in the history of first-class cricket with twin double centuries. England’s Arthur Fagg was the first to achieve this milestone when he made 244 and 202 for Kent way back in 1938. Overall, Angelo is the 5th player from Sri Lanka with back to back double tons in first-class cricket. 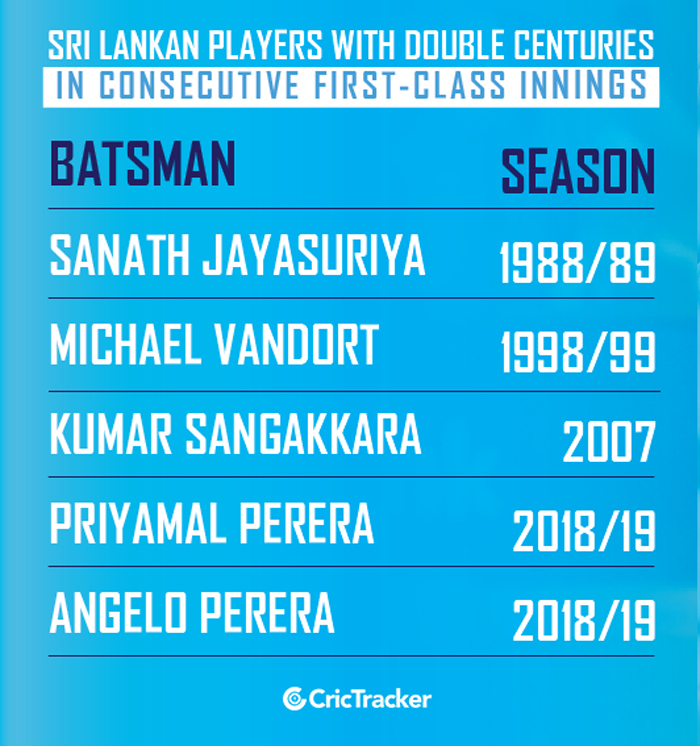 Priyamal Perera also achieved this feat during the ongoing 2018/19 season. The 432 runs aggregated by Angelo Perera are also the most in a first-class match by a Sri Lankan. The previous highest was Kumar Sangakkara’s 424 runs (319, 105) during the 2014 Chattogram Test against Bangladesh.